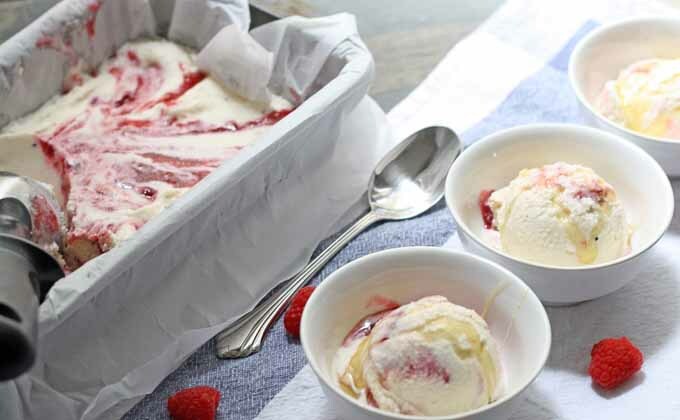 Before summer is over, try this Honey Vanilla Bean ice cream with Raspberry Swirls! Perfect for the dog days of summer! Yeah, yeah – I let this one slip by. Not that I am against turning 32, it’s a fine age. I’m just not as into the celebrating as I used to be. I went to lunch with Mr. B at a neighborhood place and then to dinner with my family. Lots of lobster. And it was a delightful, low-key birthday. (affiliate link.) If you’re an Amazon prime member, today it is only $63.59. (affiliate links), check out a few blogs. Lots of people are getting creative with ice cream nowadays and it is spectacular. I’ve been using this gift as a tool to learn more about food. 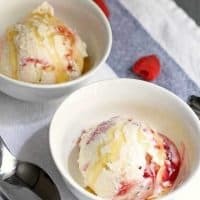 The most important thing I have learned about making ice cream is when a recipe says cold, it means COLD. If you don’t let your ingredients and the freezer bowl get really, really cold, your ice cream isn’t going to be firm enough. I found out the soft er… hard way. The first (and only) time I made that mistake, it was more like creamy soft serve. Still delicious, but not what I was looking for. At least I figured out what I did wrong so I could share it with you. 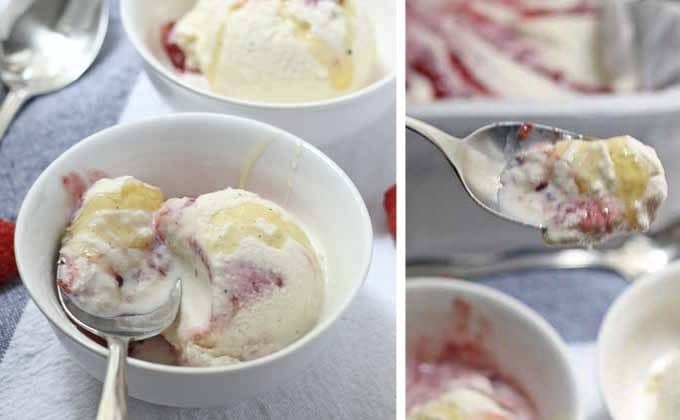 If you’re making this ice cream, I suggest putting the freezer bowl in the freezer overnight and making the syrup and liquid the night before. This will give everything a chance to get really cold before you get your ice cream machine churning. 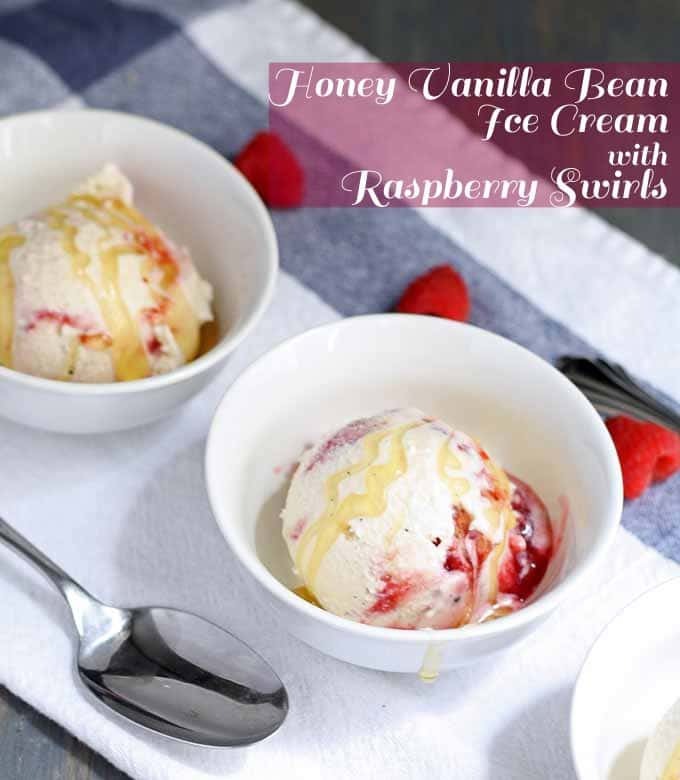 Once you’re ready to rock (meaning you have followed the recipe below and are set to start eating,) grab your honey and any leftover raspberries or raspberry syrup you have. Pick one and drizzle it over the scoops to add a little extra of that flavor to your dessert. Or if you’re feeling especially saucy, add a little of each. For these pictures, I chose to drizzle just the honey on top. And I almost devoured all three bowls. Split the vanilla beans lengthwise and scrape out the seeds. Add the vanilla bean pods, vanilla bean seeds, cream, milk and honey to a saucepan. 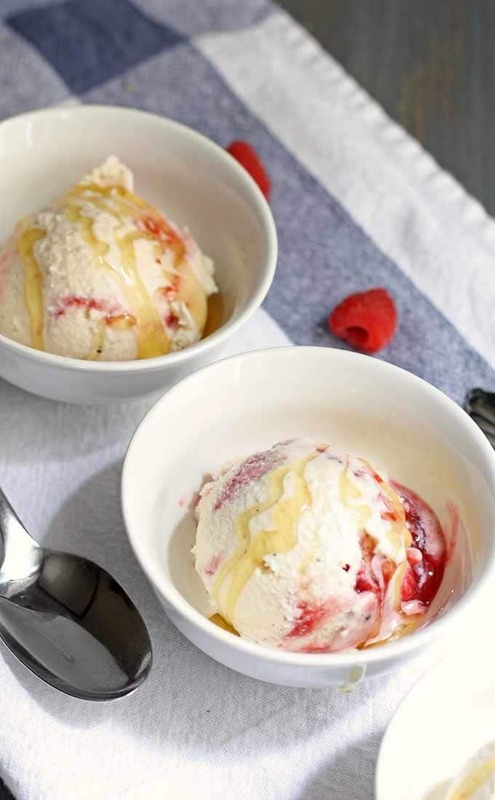 Combine raspberries and honey in a small saucepan. Turn heat to high and bring to a boil, then simmer over low heat. Keep at simmer until raspberries are soft. Use a fork to smash the berries. If you want a smooth sauce, put in a blender. Pour sauce through a fine mesh sieve into a bowl, to remove the seeds. Remove the vanilla bean pods from the milk mixture and pour into the ice cream maker. 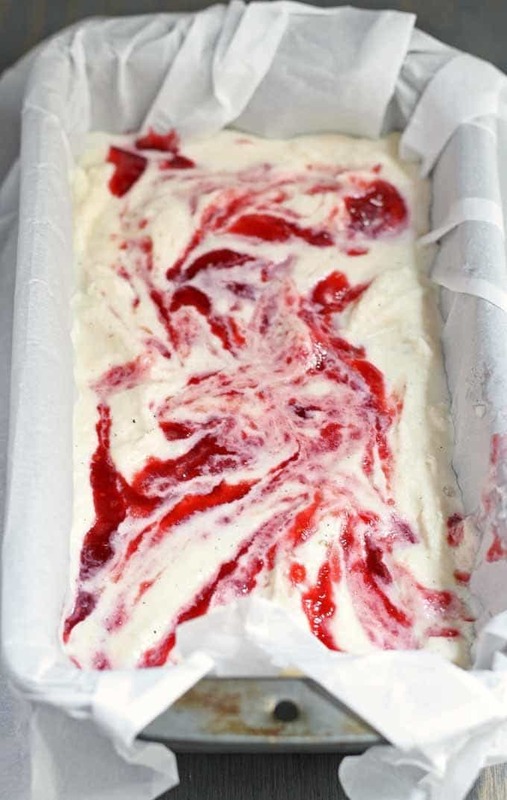 Churn for 20-25 minutes, or until the ice cream has formed and is firm. Sprinkle raspberry syrup into the bottom of the bread pan. Pour half of the ice cream into the bread pan. 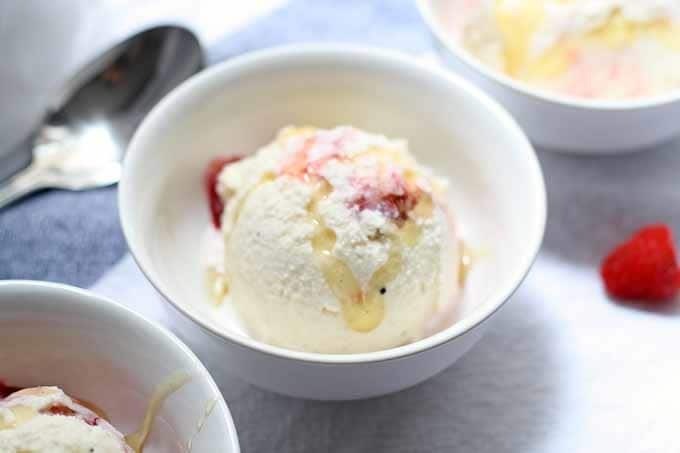 Sprinkle more syrup on top of the ice cream. Use a knife to swirl the syrup. Repeat with the remaining ice cream mixture and more syrup. Freeze for 4 hours before serving. 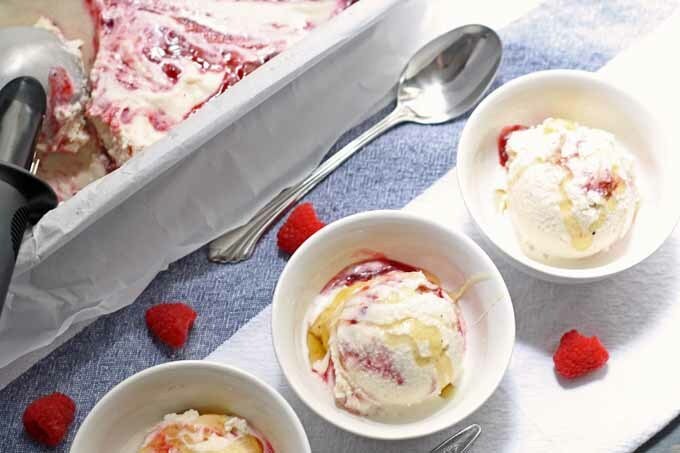 Serve with drizzled honey, fresh raspberries and leftover raspberry syrup. I just picked up some raspberries and didn’t have plans for them! This looks like just the thing to make! Perfect for these super hot days we are having! Thanks for stopping by Annie – you’re right! It IS perfect for hot days – enjoy! 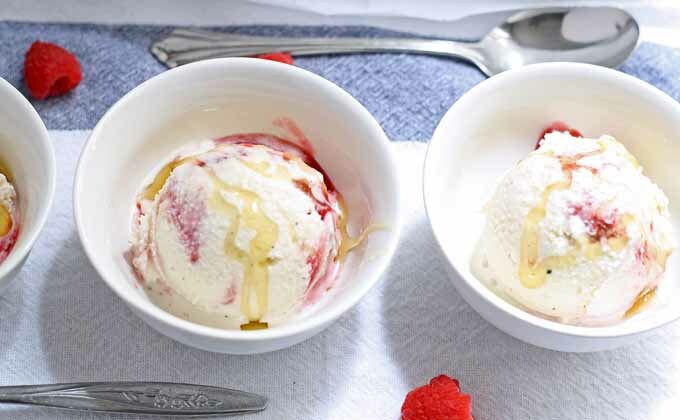 I love fruity ice creams…this looks amazing! 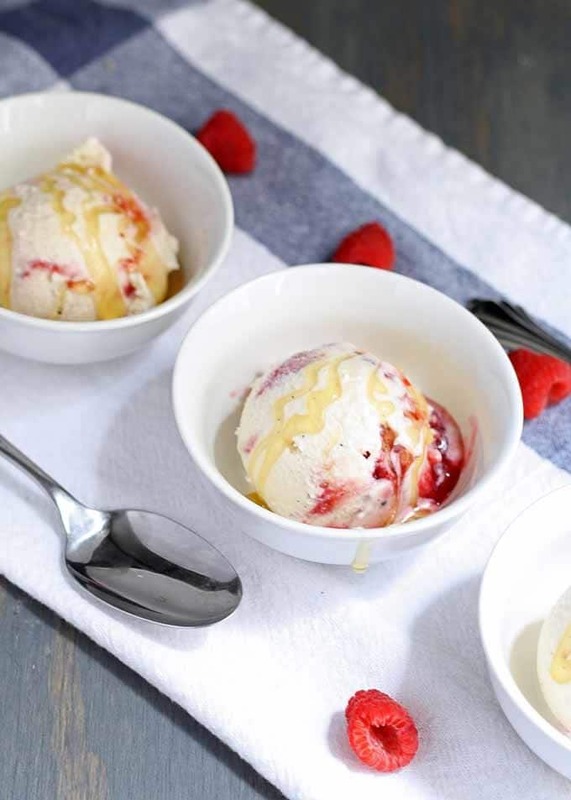 I think I might need one of those ice cream makers… Pinning and stumbling! Thanks for linking it up with us at Foodie Fridays! Thanks Michelle! It’s way easier to make than I expected! Oh my goodness does this look lovely and decadent and amazing and WOW! I will definitely be featuring this recipe on Foodie Friday’s tomorrow. Heck, with this recipe, I can just post and be done 🙂 Thanks for sharing, Yum! Stopping in to let you know I have featured your post on Foodie Fridays starting Thursday Evening at 9pm EST. Stop by and say hello and link up another fabulous post! Yum, it looks amazing! And the fact that it doesn’t have any refined sugar? That is great! Thanks Jenn 🙂 It’s yummy too! I have tried to make vanilla ice cream with not so good results. It tasted heavily of whipped cream. I’m going to try this recipe. It sounds really good. I like rum raisin and fresh peach ice ream. And anything mocha, malted or caramel.